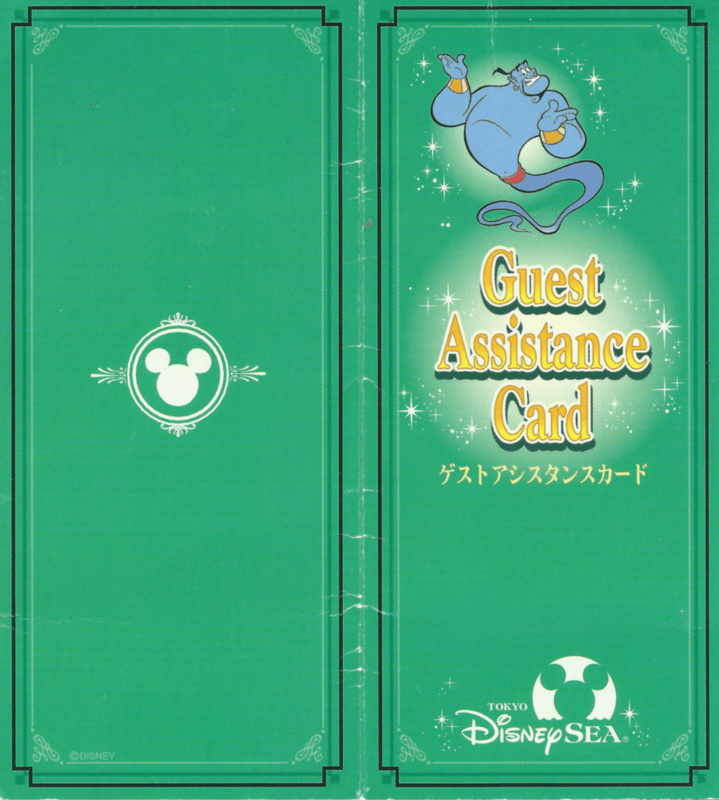 One of our most asked questions is about the Guest Assistance Card, also known as “Barrier Free” at Tokyo Disneyland and Tokyo DisneySea. This card helps guests cut their times with certain disabilities. 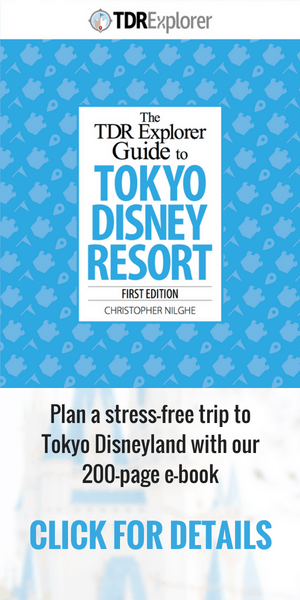 Our reader Jo and her husband have visited Tokyo Disney Resort with a wheelchair and she shares her positive experiences and provides tips on how to use the Guest Assistance Card. The Tokyo Disneyland map describes its incredibly popular Star Tours: The Adventures Continues attraction with the following tagline: “Take a StarSpeeder 1000 and go on a thrilling unpredictable space journey!” Outside the ride entrance, the signs say it is a highly turbulent, 3-D simulator-type thrill ride through space that includes sharp turns and sudden drops. The good news is, as long as you are in reasonable health and tall enough, you can ride it. It doesn’t matter if you are a Star Wars fan or haven’t seen any of the 7 “Episodes”, experiencing the amazing combination of the talents of Disney’s Imagineers and George Lucas isn’t something to miss. 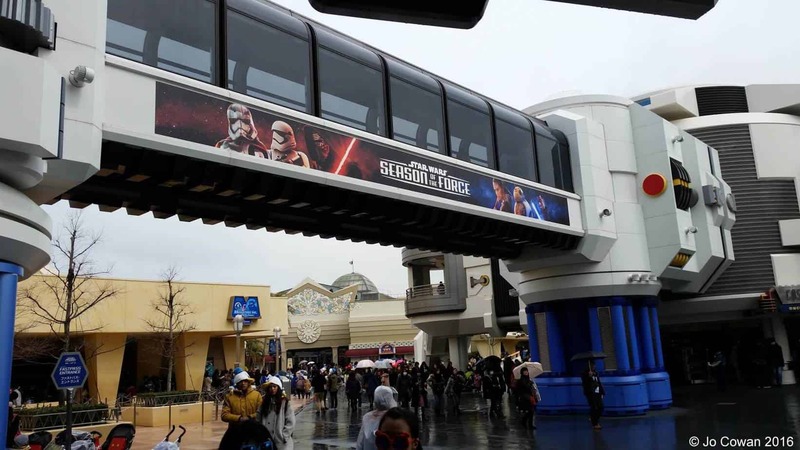 Whichever Disney Park you are in around the world, the Star Tours experience is one ‘must do’ attraction, and with the recent cinema release of Episode VII, this makes it all the more exciting. However, if you are like us and travel with a wheelchair, any ride you want to experience, no matter how sedate or thrilling, requires more planning than for those who don’t think anything of standing for hours and can easily hop into a ride vehicle. For us, my hubby John would struggle even getting to the lobby of the hotel from our room, let alone walk from 8 am until 10 pm and get thrown around on thrilling rides. So having been lucky enough to have travelled to all the Disney Parks around the world and enjoyed them from open until close, we’ve become quite good at knowing how to work within the Disney guidelines for guests with mobility issues. We absolutely love Tokyo Disneyland and Tokyo DisneySea, and have just returned from 10 days of exploring these parks, so having the opportunity to share information for others travelling with wheelchairs is a privilege. Even if you only feel like you want to give it a try, then I think I’ve been successful. Of course, everyone using a wheelchair uses one for different health reasons and has different levels of disability. For our individual case, John, my hubby, has a knee that doesn’t work anymore. He can walk short distances on soft surfaces and has enough upper body strength for wheeling the chair in short bursts and is able to get in and out of it for transferring, as long as he is relatively unrushed. 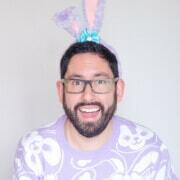 Individual pain levels are definitely going to impact the experiences and may make you and your travelling companions seriously consider whether a Mouse holiday is the way to go. For us, travelling with our wheelchair is the only way to make sure we can both enjoy our experience. We can’t see us leaving home without it. Thankfully, we have found that John’s pain levels can be managed sufficiently using the chair, but we dictate the pace and rest as required. I think most wheelchair users will understand my message here. 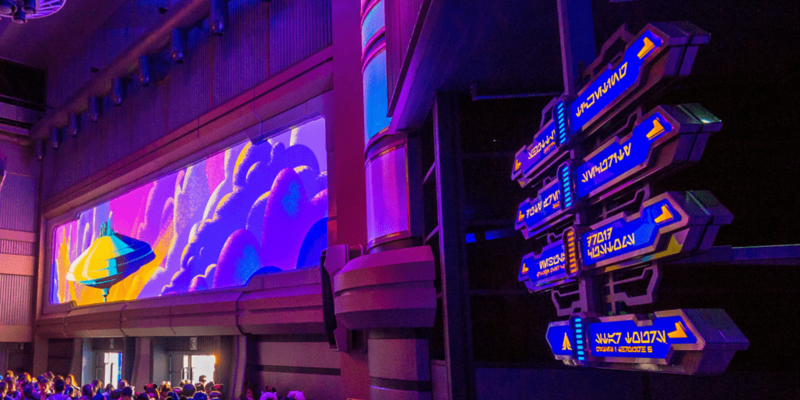 So how do you get to experience Star Tours? What magic way is there to experience what your able-bodied companions can enjoy? Irrespective of whether you start in DisneySea (as we did), or in Disneyland, it actually starts when you first enter the Disney Resort, at Guest Relations. Now, I would like to call out that we don’t speak Japanese. Our daughter, who lived in Japan for three years, said we couldn’t visit without knowing something, and she is right. We can say “Hello,” “Thank you,” and “Good-bye.” But the best means of communication, we learned, is the smile. The Japanese people, we have found on both trips to Japan (2012 and 2016), more than anywhere else in the world, respond to a genuine smile. If you smile and are happy, the Disney Cast Members, convenience store cashiers, hotel staff and the cruiser bus drivers you meet on your holiday will try their best to be as helpful as they can to you and your party. You might be the first person who has taken the time and smiled at them today, and they see thousands of people, especially those wanting to ride Star Tours. So if I can give you one tip: Before you go around the corner or through that doorway, take a moment to check that your smile is in place. Then you’ll get a lot further with the “pantomime” of explaining what you need help with. Guest Relations in Disneyland is beyond the entrance gates, but before you go through into World Bazaar. It is on the left-hand side and shown as an “i” on the map. In DisneySea, it is close to the statue of Walt Disney and Mickey Mouse on the North Entrance side of the Plaza, which is opposite to the walkway through to Mediterranean Harbour and marked with a hand pointing on the map. It is there that you can obtain a Guest Assistance Card. This little blue or green card will alert the Cast Members that you need assistance and allow you to enjoy your chosen attraction at a designated time. 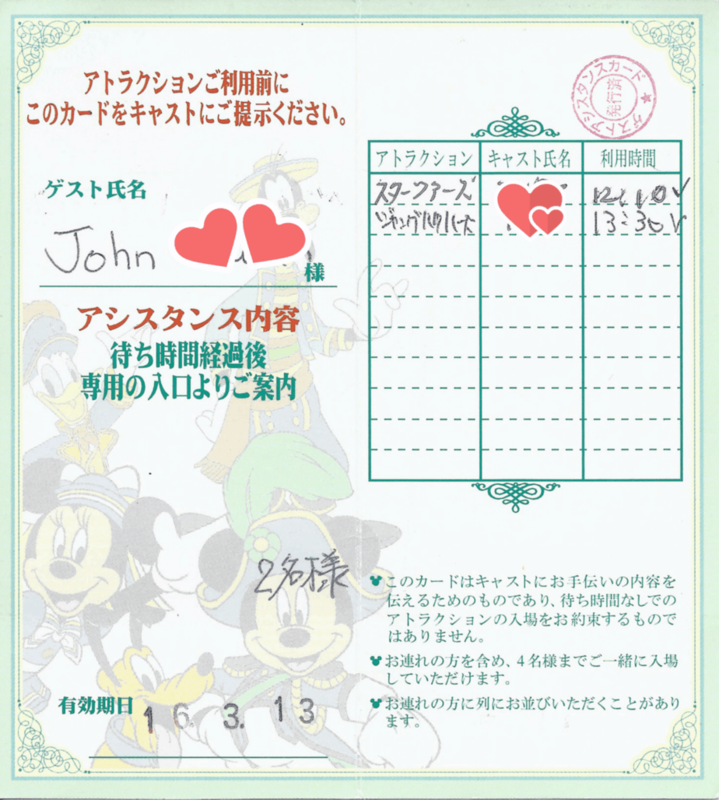 If you get your card in DisneySea, it will be green; if you get it in Disneyland, it will be blue, but you will only need one to cover both Parks. When you are in Guest Relations with your best smile on, you may find you don’t have to line up for help for very long. 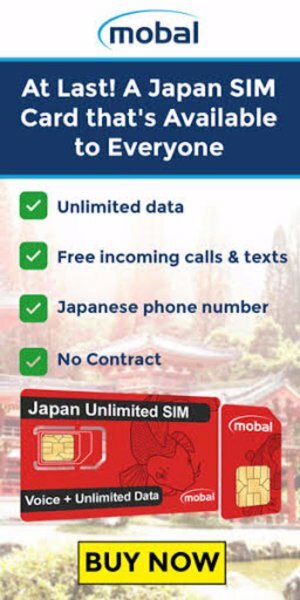 If not of Asian origin, chances are you are going to stand out (or sit-down if you are in your chair) among other guests others waiting for help. We’re Australian and I’m quite tall, and we’re both fair-skinned and have light-coloured hair, so we are easy to notice as being tourists. And when approached and spoken to in fluent Japanese, it will be pretty easy for the Cast Member to know that we’re going to need help from a Cast Member who speaks at least a little English. Luckily, we had worked out what we needed, so that made it much easier. We wanted a Guest Assistance Card, which they happily organised for us. The card is all in Japanese, so we have no idea what it says. We filled out John’s name on it and let them know when we were going to be leaving the Disney Resort. That becomes the stamp on the bottom of the card. Keep it safe. We kept it with our tickets so it was readily available if we needed it. Just like the FastPass system, you can only have one Attraction queued up for you to experience. Once you have ridden or experienced that Attraction, you can get another one – or the same one again loaded, just like with the FastPass system. It doesn’t provide you with a faster means of riding over able-bodied people (generally). When you get to an Attraction, have it in your hand, even if you don’t need it to ride. It seems to be a validation that you do need some assistance. If the Attraction offers the FastPass ticketing system and you are lucky enough to get one, present it and your Guest Assistance Card to the Cast Member at the Attraction’s FastPass entrance, to be assisted, along with your caring companion, to get to the ride boarding area. If you are travelling with your family, check with Guest Relations how many people can be with you. It may be immediate family or companion only. As there are only two of us, there’s not an issue with us both riding together. If the Attraction offers the FastPass ticketing system, but they have finished dispensing these or the return time is not convenient, eg. it is late in the day/evening, you can present your Guest Assistance Pass to the Cast Member and they will mark it for the time to return to take the ride, as if you had been in the Standby line. We had our card marked for 70 minutes in the future and were allowed to leave the area and return at the nominated time. You may be using an alternative entrance, so it is possible you won’t experience all the theming that goes into the queue and holding areas of the ride. Your experience might be an elevator/lift and a corridor with closed doors. Your path to the ride/attraction will be the one without the stairs or long ramps and be the quickest way to get there. So even if your other travelling companions are also entering the standby line at the same time, it is likely you will be riding long before they have wound through the inner line up. Cast Members are not permitted to help you. It will be up to your companions to assist you at all times if you need help to transfer, although they will likely assist with getting your chair out of the way. If you have to transfer from your chair, make sure you or your companion has all your valuable items with them, as your chair will likely be out of sight in a holding area until you’re reunited. So, you’ve selected to ride Star Tours. Good choice. It is a fun ride that puts you right into the worlds and space that is found in the Star Wars movies. There are a number of different experiences they can put you through and you won’t know which one you are going to get until you are strapped in and the doors are closed. We couldn’t get a FastPass for Star Tours, as they were all dispensed for the day and it was only around 10 am. Our only option was to ride it via Standby. Smiling, with our Guest Assistance Card in hand, we approached the two Cast Members who were standing at the end of the Standby line, which was very long. We were greeted in Japanese and they started talking to us as if we understood, which of course we didn’t. But we just calmly asked, “Where do we go to ride Star Tours.” They immediately changed from Japanese and in broken English, saying only a few words, asked us to follow one of them. We were taken over to the entrance way to the ride, where they indicated for us to give them the Guest Assistance Card. The first thing the Cast Member did is check if we already had an Attraction return time marked on it. If you do, then you’ll need to ride that first. They then checked how long the wait is for someone at the back of the Standby line to reach the front. That’s how long we were going to need to wait before we could ride. So effectively, the Guest Assistance Card is a “place” in the line. They noted the return time on the card and some other information, all in Japanese characters then showed and explained as best they could the time to return and that we needed to return back to this spot just before that time. Cool – we could do that. We had 70 minutes until our return time. What was nice for us was that we were able to leave the area and have some lunch and then come back at 12:30. We didn’t have to join the line. (I am only able to report what has happened to us previously. That isn’t to say it will always be like that). In the event of an emergency can negotiate the emergency exit of the ride – which may involve walking and stairs. Yep, John understood and acknowledged he could do all that. In fact, we got Guest Relations to write that out for us to reduce the effort of having to ask us each time. At our allotted time we were all good to ride and were asked in broken English to follow the Cast Member, who very nicely kept turning around to check we weren’t getting too far behind and they hadn’t lost us. We were led away from the ride entrance area and down the side of the building,through a chained-off area, and in through a Cast Members Only entrance. Once inside, we were taken to an elevator/lift, which we were accompanied in and taken to the floor where the ride departure holding zones were. This is all that the alternate entrance allows you to see: the lift and the corridors where doors marked “Cast Members Only” are closed to prying eyes. Having ridden Star Tours without John in 2012, I knew that the standard entrance to the ride is filled with theming from the films. While unfortunately, that is not accessible to us, it doesn’t matter; it’s the ride we came for. We didn’t get to ride straight away after exiting the alternative entrance corridors, as we had to wait for the StarSpeeder in Bay 1, and that was currently in action. I could see it was in action on the Cast Member’s console monitor, where all the riders can be seen. Our Cast Member helper handed us over to the team looking after the ride, and we are asked to wait where we were. We thanked our first helper and were handed the fashionable 3-D glasses so we could enjoy the ride even more. While we waited, other guests were directed to the line-up for the ride, and we joined the end of line 1. That would seat us in the front row, closest to the pilot, the worried C3PO. From our line up position, the overhead pre-show monitor shows our StarSpeeder 1000 being prepped in the hanger bay. It is a comical, lighthearted slap-stick show in Japanese followed by a female-voiced robot telling us the rules of riding – including no photography or video during the ride. 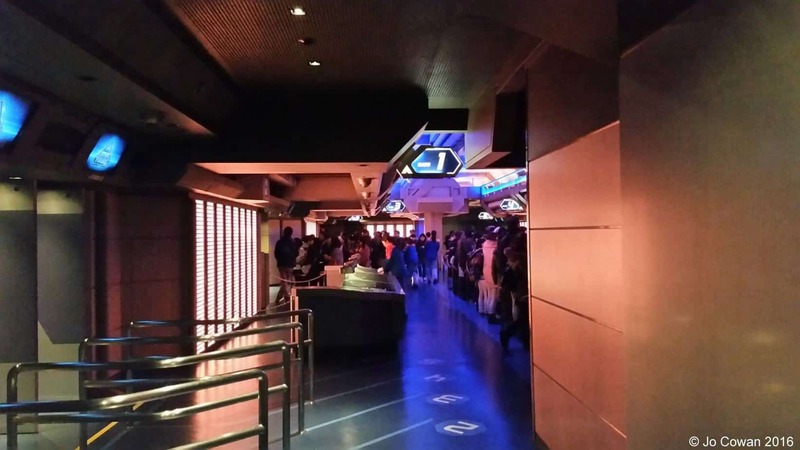 When the StarSpeeder’s door is opened, everyone advances across the seating rows and dutifully fills all the spaces. We follow them down, still with John in the wheelchair, to the first seats we come to. John will be on the end of the row, I guess so that in an emergency we can get him out quickly the way we came in. By comparison to seating in the other rows, this has plenty of leg room if you need to stretch your leg out and seems to be less turbulent than the other row I rode in, in 2012. Once at his seat, the Cast Member who has followed us in directs me to where I will sit alongside John and then stands behind the wheelchair while I assist John in transferring into his seat. They are very patient, but it pays to be prepared for the fact that you will need to get out of the chair and into the ride seat quickly. As soon as John was out of his wheelchair, the Cast Member wheeled it back out of the StarSpeeder. She then returned to check everyone was strapped in and made the lights on the control panel show up as the harnesses were engaged. Once we were all strapped in and had followed the “tug on the yellow strap” test, we were all good to go and were handed over to our pilot C3PO. All that reminded to be done was put on your 3D glasses and sit back and enjoy the ride. The description of the ride experience is as it states in the warning. However, we’ve found if you can sit up independently and are able to plant your feet on the floor and brace yourself with the help of the back of the seat and the specially designed armrests, which are designed for people who need to hang on tight, it should lessen the jolting sensations. You are on a spacecraft that is simulating what you are seeing on the screen, and some of the sudden drops sure feel like you are going to fall out of your seat if it wasn’t for the harness. What we also love about this ride in Japan is that the other Japanese participants (predominately female) squeal and laugh during the ride, adding to the enjoyment of the experience. All too soon C3PO and R2D2 get us to our destination – not necessarily safely, but that is part of the fun. We’re allowed to leave once the doors on the other side of the Speeder open upwards. Everyone leaves, and then our Cast Member comes in with our wheelchair and stops it in the same place as when John got out of it. He again stands and turns to sit in it and I quickly assisted with the feet plates before we wheeled out of the simulator. We were again directed to follow a Cast Member back down corridors to an elevator/lift and back down to the Park level. We exited in a similar location to where we went in, around the side of the ride building. We were again let out of the chained-off walkway and said our thank you and good-bye to our helper. Having thoroughly enjoyed our experience, as always, racing around the galaxy and getting out of the mishaps C3PO got us into by a Wookie whisker, it was back into the Disneyland Park and time to work out what else we had on our list to do today. There are so many wonderful experiences to be had at the Tokyo Disneyland Resort, both in and out of the Park. We have never seen our wheels as being a barrier to enjoying what is on offer, but we do take the time to think about and research what able-bodied people have to show about the attractions; such as write-ups and videos. We are very thankful that the Cast Members at Tokyo Disney and the staff at the Hilton Tokyo Bay Hotel don’t see our wheelchair as a barrier and want us to have a “Wonderful Day” (regardless of the hour). Feature photo by Duy Phan Photography.